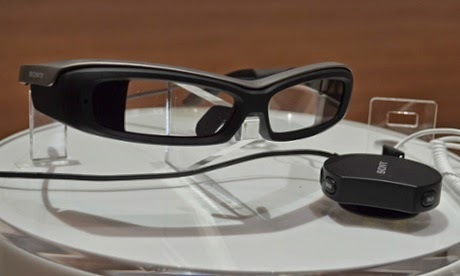 As Google shelves/delays its Google Glass project, Sony has stepped up into the wearable computing fray with their idea for a product called SmartEyeglass. Currently the "screen" only shows up in green and the battery life is a meager 2.5 hours. The device will interface with your smartphone allowing you to see apps on your phone right in front of your eyes, of course it will only be in the color green. It also has a wire attached to it for controlling the specs. All things considered, I can't see them selling very many of these. Seems to me there are too many drawbacks to be seriously considered as a "must have". Google Glass was a better product and Google is re-working that concept so I don't see Sony doing any better.